Honey bees are chemists. Using enzymes and dehydration, these scientists of the natural world are able to change the sugar in nectar into a supersaturated power food. It’s no small feat-honey is composed of at least 181 components. Its unique taste is a result of complex chemical processes, which is why sugary syrup substitutes just can’t compare. They can’t mimic Mother Nature’s chemical know-how. Last year alone, bees in the United States produced a whopping 158 million pounds of honey. That’s a lot of chemistry. Honey is composed mostly of the sugars glucose and fructose. It’s what scientists term a supersaturated solution. When sugar is stirred into a glass of water, some sugar is usually left at the bottom. That’s because the water (solvent) will only dissolve a certain amount. But, if the water is heated, more sugar can be dissolved. 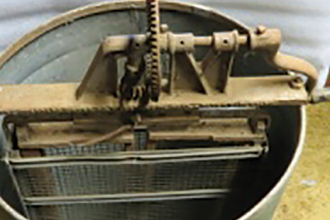 Consequently, in supersaturation, heat, enzymes or other chemical agents can increase the amount of material dissolved. These solutions tend to crystallize easily. 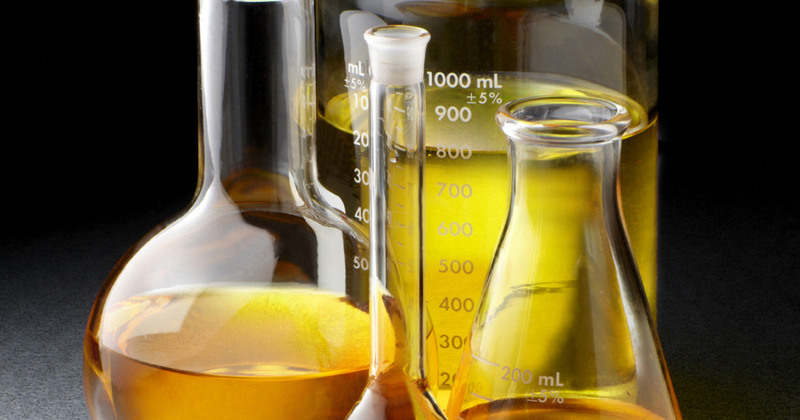 Syrup, fudge and honey are all considered to be supersaturated solutions. Because of its supersaturation and low water content (15-18%), honey is viscous. That means it is rather thick in consistency and sometimes it’s solid. Its main ingredients are carbohydrates (sugars,) but it also contains, vitamins, minerals, amino acids, enzymes, organic acids, pollen, fragrance and flavor compounds. All honey begins with nectar. Whereas honey is viscous and has a low water content, nectar is about 80% water. It’s a very thin solution- colorless and not nearly as sweet as honey. It’s also chemically different. Through the use of enzymes, bees are able to convert the complex sugar in nectar into more simple sugars. This is why honey is more easily digested than regular table sugar. Its sugars (glucose and fructose) are simpler than sucrose (table sugar). Sugars are sometimes called “sweet carbohydrates.” (Carbohydrates are one of the three primary classes of foods, along with proteins and fats.) Some sugars like glucose and fructose are simple, while others such as sucrose (table sugar) are more complex. A honey bee’s secret weapon is its ability to change these complex sugars found in flower nectar into simple sugars. This process is called hydrolysis. In order to change sucrose (table sugar) into glucose and fructose, heat, acids or enzymes must be added. It’s a complicated process in the lab. But, when it comes to honey chemistry, bees (and their enzymes) are far more efficient than scientists. Because 95 to 99.9 % of the solids in honey are sugars, in order to understand honey, it’s necessary to understand sugar. Pure cane sugar is almost all sucrose. It’s called a disaccharide and is formed when two simple sugars are joined. That’s why it’s sometimes called a “double sugar.” Sucrose, which is found in nectar, is made of the simple sugars glucose and fructose. These simple sugars are called monosaccharides, which means “one sugar.” Even though fructose and glucose have the same chemical formula (C6H12O6), they’re two different sugars. That’s because their atoms are arranged differently. This difference in atomic arrangement, makes fructose taste much sweeter than glucose. Honey is also slightly sweeter than table sugar, because honey contains more fructose. Like any good chemists, bees follow a protocol in order to make honey. Forager bees draw in nectar through their proboscis (straw-like tongue.) They then add invertase while they carry the nectar. This invertase begins breaking down the sucrose into glucose and fructose in the honey stomach (crop). The foragers then transfer the nectar to the house bees, where more enzymes are added. This enzyme-adding process continues each time another bee picks up the nectar. House bees regurgitate and re-drink the nectar over a 20 minute period, which further breaks down the sugars. When the nectar is about 20% water, it is deposited on the honeycomb, where the bees fan it to speed up the evaporation process and further condense the honey. The bees stop when the water concentration is between 17-18% and move it to its storage location. Thus, through the use of evaporation and enzymes, a supersaturated solution has been formed. Like any supersaturated solution, honey tends to crystallize. Crystallization occurs when long chains of glucose (polysaccharides) in the honey are broken down. The glucose molecules start sticking to one another usually on a speck of dust or pollen. These glucose crystals then fall to the bottom of the jar. The problem with crystallization is that when the glucose is separated from the honey, the leftover liquid contains a higher percentage of water. Yeast, now with enough water and sugar causes the honey to ferment. That’s why honey that crystallizes may ferment more quickly than non-crystallized honey. Temperature can affect crystallization. Honey is best stored above 50ºF. Researchers have also concluded that honey removed from the comb and processed with extractors and pumps is more likely to crystallize than honey left in the comb because of the fine particulate matter introduced for crystals to begin on. 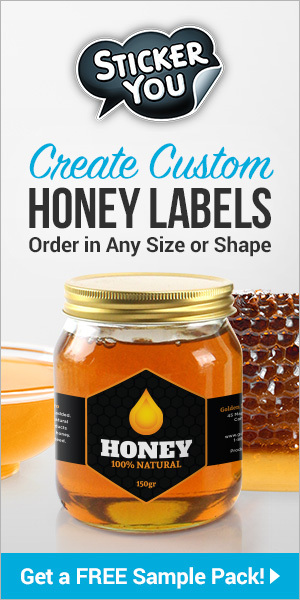 Other factors that contribute to crystallization are dust, air bubbles, and pollen in the honey. Crystallization isn’t always bad. Creamed (spreadable) honey depends upon controlled crystallization. While natural crystallization creates grainy crystals, controlled crystallization creates a smooth and creamy product. Heating honey can cause chemical changes, as well. Sometimes, honey darkens due to a process known as the Maillard Reaction. Because honey is slightly acidic with a pH of about four, browning can sometimes occur over time. This is because the amino acids in honey begin reacting with the sugars. Caramelization, the browning of sugar, is caused when heating begins breaking the molecular bonds in the honey. When these bonds are broken and then re-form, caramelized sugar is the result. Heat can also affect both honey and high-fructose corn syrup. When fructose is heated, HMF (hydroxymethylfurfural) can sometimes form. HMF is deadly to bees. HMF can form at relatively low temperatures (110-115oF.) If honey bees are fed high fructose corn syrup that’s been stored or transported in hot conditions, it might kill them. Heat and crystallization can also affect the color of honey. Crystals in honey will cause it to appear lighter in color. That’s why creamed honey is lighter in color. In nature, the color of honey is usually due to the type of flower nectar from which the honey derived. Consequently, honey collected in the Fall will usually differ in color than honey collected in the Spring. That’s because different flowers are in bloom. The USDA classifies honey into seven color categories: water white, extra white, white, extra light amber, light amber, amber and dark amber. 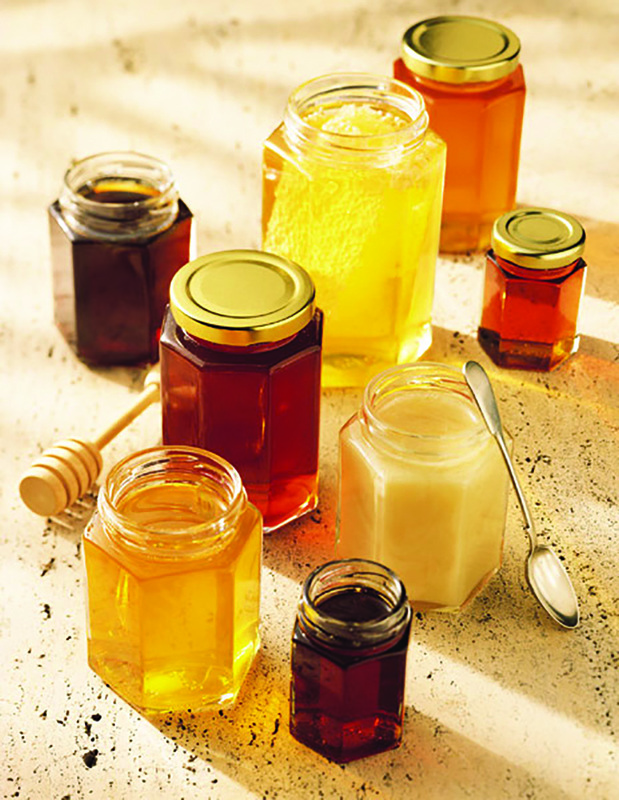 Light colors of honey most often have a milder flavor than darker honeys. Honey is hydroscopic. That means it collects moisture. If it’s left uncovered, honey will begin to collect moisture from the atmosphere. This extra moisture in the honey will allow the yeast to begin the fermentation process. Normally, honey has a low moisture content which helps in preservation. If, however, its moisture content rises above 25%, it will begin to ferment. That’s why collecting capped honey from a bee hive is a good idea. It has a lower moisture content and is much less likely to ferment. Honey is produced in every state of the U.S. The USDA estimates that there are over 266 million colonies in the U.S. with the average colony producing 59 pounds of honey. What makes these numbers most remarkable is that honey isn’t manmade. It’s only guided by man. The true chemists in the production of honey are the bees. Their ability to seek out and convert nectar into honey has resulted in literally hundreds of different floral varieties of honey. Those are some sweet statistics. Carbohydrates and the Sweetness of Honey. The National Honey Board. (1995). Honey: A Reference Guide to Nature’s Sweetener. National Honey Board. Firestone, CO. (2005). Janini, Thomas E. Chemistry of Honey. The Ohio State University College of Food, Agricultural, and Environmental Sciences. (2014). Kappico, Jenifer T., Asuka Suzuki, and Nobuko Hongu. Is Honey the Same as Sugar? The University of Arizona: College of Agriculture and Life Science Cooperative Extension. AZ1577 (2012). Manyi-Loh, Christy E., Roland N. Ndip, and Anna M. Clarke. Volatile Compounds in Honey: A Review on Their Involvement in Aroma, Botanical Origin Determination and Potential Biomedical Activities. Journal of Internal Molecular Science (2011); 12 (12): 9514-9532. Sammut, Dave. The Tale in the Sting. Chemistry in Australia (2015): 18-21. Viuda-Martos, Manuel, et al. Aroma Profile and Physical-Chemical Properties of Artisanal Honey from Tabasco, Mexico. International Journal of Food Science & Technology 45.6 (2010): 1111-1118. Sharla Riddle is a retired educator and freelance author. She has been named a Huddleston Scholar, Tandy Scholar and RadioShack Science Chair. Her previous articles have appeared in Bee Culture, Teaching Today and Gifted Child Today magazines.